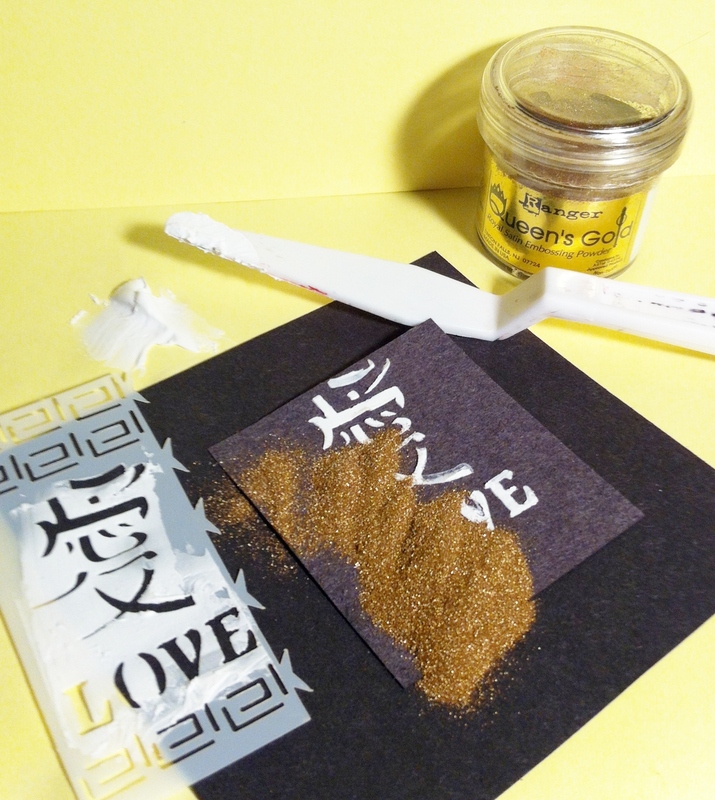 I have to say it is the excitement that drew me in of seeing the embossing powder melt into gold or silver images. It is still like magic, to me! I like them all according to what design calls to me. The clear stamps are easy to use for placement. Hate to be boring but I like every stamp I have in Asian. I have a bit of a problem with some tiny ones I have. They are hard to see the fine lines of the image. Perhaps they are not a good choice but handy for using on ATCs. Several…as the heat gun, paper cutter really help me. I started out with heat from the toaster and the scissors. Even with the paper cutter, I still haven’t mastered straight lines! Brads and ribbons are the easiest and come in grand colors to compliment the inks and papers. This sounds silly, but it is the seriously dangerous pointed sharp stylus that I pierce the paper with for brad holes or designs. It is sharp and tapered so it makes different size hole according to how hard you push it into the paper. The bone folder and the Scor-Pal help me a lot. I try all the tips shared, so actually the members are a biggest tip asset to me. Unusual shapes, designs, and mysterious looking scenes. Flowers are beautifully executed in oriental images. Graceful oriental figures are intriguing. Just about any place I visit… but really my arty space is full of stamps; many are not even used, yet. We had our last name “chop” stamp made on a trip to China, and getting the paper cut pictures there was a pleasure. China newspaper pages are saved in my stash, to use for the paper art. I bought beads there, but never dawned on me to find rubber stamps, duh. I collected swell stamps appropriate to Alaska, on one of our trips there. There are several paper folding groups that are fun to follow, so I am learning to do tea bag folding. I think Iris Folding is perfect for the oriental themes My own group ATCsUSA-International, is one I faithfully follow, with different themes by the month. I am such a dud as to these anymore. The Internet has spoiled me. My stash of old Rubber Stamp Madness is great, and it is a local Corvallis, Oregon company. I might have to re subscribe! Not really. VSN asked to share some of my ideas, in a couple of magazines, no cards or pictures. Knitting, sewing, china painting, reading, cooking interesting and often orient-inspired meals. It is interesting to pursue vegetarian ideas and lowering calories in all recipes. Color and shapes, different stamps, as well as *junk, oddities, that I want to incorporate on a card. Encouraged from childhood in art by family, and one special aunt. I always had oodles of art supplies; fun times! Art classes at Oregon State eons ago, various classes in Tole painting, china painting, rubber stamping, colored pencil and craft classes. I have taught children’s art, Tole painting, use of wallpaper for cards, and rubber stamping. *Junk: cardboard, light bulb sleeves, tissue box images, clay images of stamps in relief…on and on. Ground up lake reeds are great for making paper, inked tree branch images pressed onto paper for a background. It is fun to troll the aisles in the home improvement stores for metallic tape and clever stuff in the plumbing supplies, copper wire and even some small flat wood items that have worked well on cards. There is no way that I would infect the group with the huge list that I have learned from. I could be an enabler, but no. Look and learn, because that is where you find something to inspire you, without thinking you must use someone else’s ideas. I have widened my rear considerably scoping out the beautiful art of others. I know it is an addiction…But, I still do it. I am retired. Sometimes when thinking back to work days… I believe I almost got more accomplished, when I had a schedule. Bob and I have been married for 55 years. We live in Bend, Oregon and are native Oregonians. We have two married sons, four grandchildren, two great grandchildren, two married step grandchildren and one step granddaughter. Two crazy Bengal boy & girl sibling kitties, run our house. Nice to have lots of grand dogs, too! We tried living in Arizona, and loved doing a lot of traveling.Now we are back in Oregon for good, but haven’t ruled out another fun trip. Use water soluble, kitchen and bathtub caulk. It comes in white and almond. These caulks are available in the hardware section of all larger stores, such as Wal-Mart, and of course in Home Depot, Lowe’s and Ace Hardware. There are colored caulks that are used to seal wood and laminate flooring. They come in wood tones and are more expensive. I have bought the colored caulks at Home Depot. There have been caulks at Ace Hardware on their sales…I have not followed the sales recently. Watch for sales at your local hardware stores. Possibly there are tubes of it at the Dollar Stores? White caulk is good for basic use. 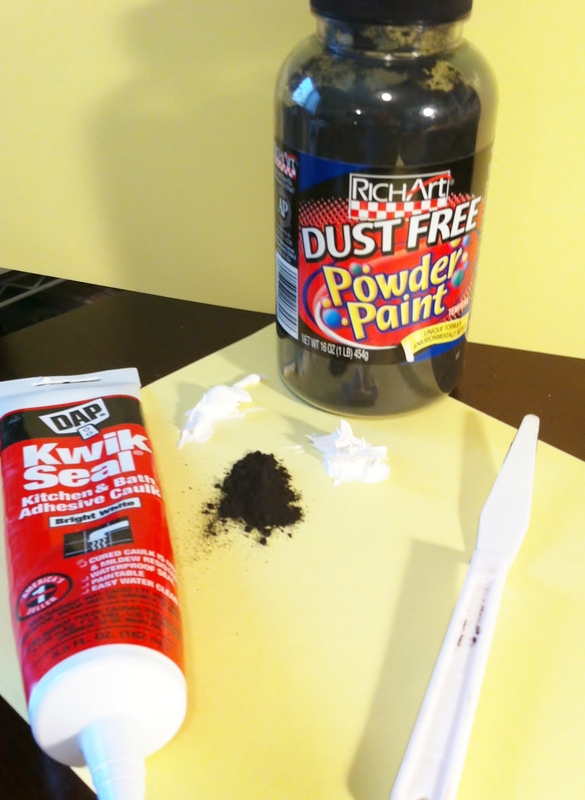 The one I have right now is made by DAP and is called Kwik Seal. It is water soluble until dry, as you might expect in tub caulking needs. Caulk takes longer to dry than art stencil paste. Caulk is fairly flexible when dry, and rarely will pull off or chip. This is good if you are using a stencil image on paper, on a rounded object, such as a jar or vase. I have colored it with acrylic paints and I have used it out of the tube. Start with a small amount of color and add as needed. 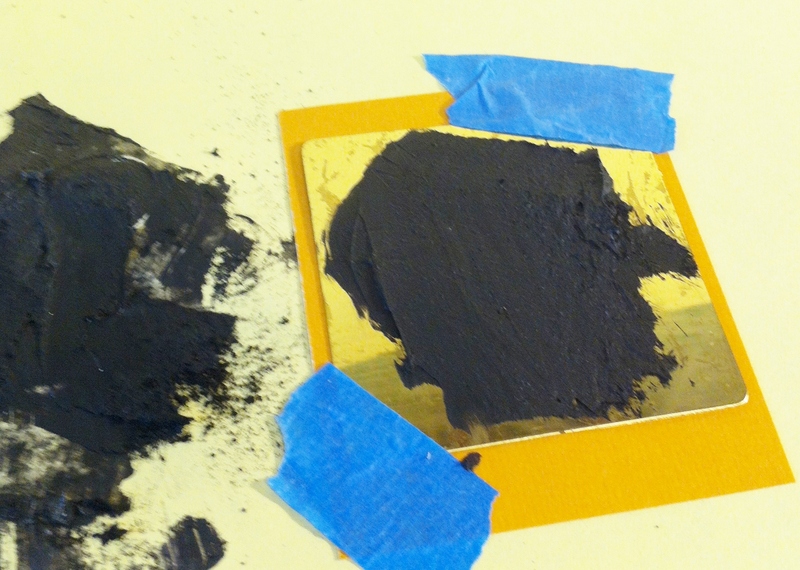 Dry powder paint is best when making the caulk black, as acrylic paint thins it to much to get a strong black. The almond caulk is good when used with warm colors and makes a nice tone to add all colors to, as it mutes them slightly. It can give a rather sly bubbling effect when heated before it has had a chance to dry. Heat it and see what happens with embossing powder and other sorts of surface additions. It is rather fascinating to try a lot of techniques. 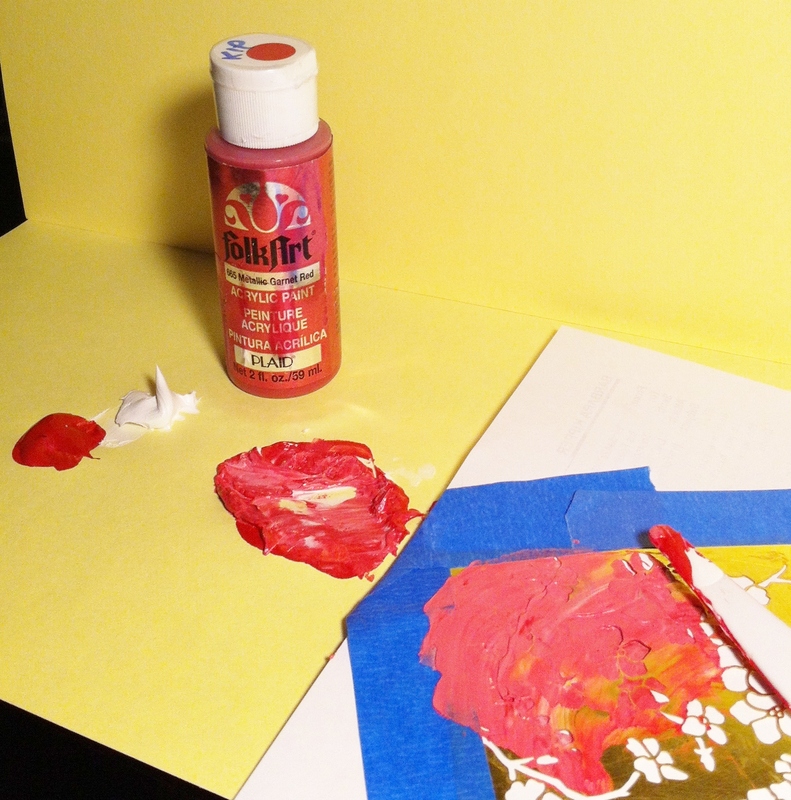 You can experiment on using it as you would texture paste in painting and making backgrounds. Use your palette knife or stiff artist’s brush, and do a drawing on a canvas with it and then paint over the designs or textures. It can be thinned with water if that is needed. NOT: When caulk is too dry, you cannot thin it, as it has changed to a sealer permanence . 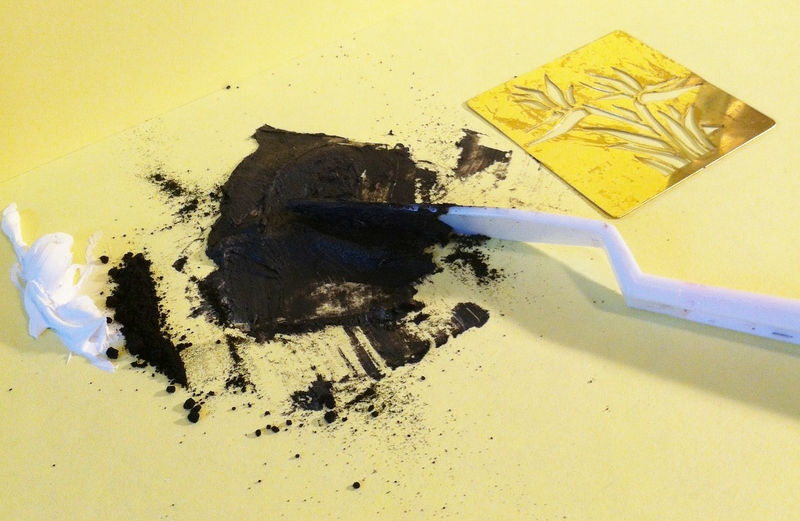 If you let caulk set up to just the right level of dryness you can place a stamp using colors of ink or clear ink over it and impress your stamp design into the surface. Too wet and it is not as effective, as it is squishy. Too dry and the stamp will not impress. This is a play with me, situation. I have used the clear caulk which I believe is available at Ace Hardware, and other places, but it is nasty stuff, since it is not water soluble. If you should ever get any on your glasses, head to the optometrists and get a new pair of lenses! Congratulations Barbara and thanks for an interesting tutorial. I always wondered if caulk would do in place of embossing pastes and now i know. Thanks for stepping bravely where I dared not go. See you on the teabag site. Enjoy your month in the spotlight. Wow! Loved reading your bio Barb! Your collection of cards are beautiful and so beautifully made! TFS your ideas and techniques. Enjoy your month as SAM! 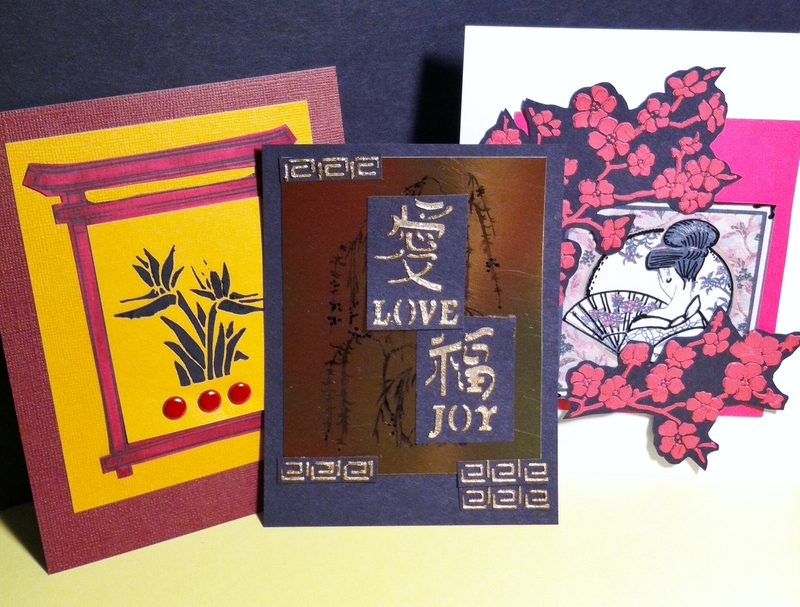 Your creativity is boundless as evidenced by your beautiful cards! Thank you for sharing techniques and tips. Well deserved November SAM! !